We had a classroom library, but we didn't really have a reading corner. There were just a couple of bean bags against the north wall and 5 small bookcases full of books on the west wall. It wasn't too convenient, so the students decided to come up with a way to create our reading corner which we call "Relaxation Station." Since the bean bags were on the north wall and that was also the best place for a reading area, the students moved 2 of the book cases to the west of the bean bags, 2 on the east side of the bean bags and angled the 5th one from the east side. They placed our two folding chairs in the reading area as well. Since the books on tape, tape players and Leap Pads were previously on the east wall of the classroom they were also moved to the reading area. We also have our talking globe and our Geo Safari here. 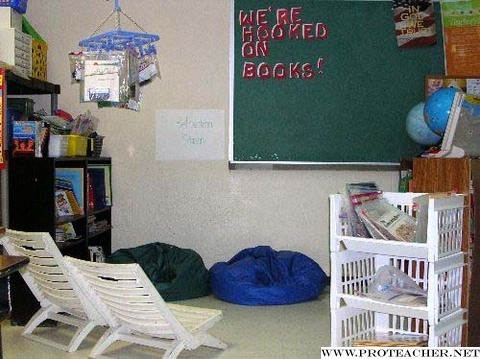 We brainstormed and decided to add "We're Hooked on Books!" so that others will know that my students enjoy reading. If students take a book out of the reading area they check it out by writing their name on the library card and filing it in the card box. Students from other 3-5 grade classrooms also check out books from our classroom library from time to time. My students also like to use this area for when we they work with partners on lessons or when doing artwork related to a book we've read aloud.